Are easy to make and perfect for game day!Hi friends! Today I’m excited to not only bring you an easy and delicious recipe, but remember, each month on the 12th, 11 of my bloggy friends and I are bringing you a delicious and easy recipe, with a theme! And the theme this month is 12 Game Day Wing Recipes! Are you a big wings fan? I have a confession – typically I only go “boneless” and have NEVER made them at home. SAY WHAT?! I guess because I wasn’t the hugest fan, it never occurred to me to make my own wings. But they are TOP on my husband’s list of favorite foods so when the gals said they wanted a wings-themed month I thought, better late than never and set out to find an easy starter recipe. I knew that I wanted to bake these babies because me, oil and frying always terrifies my husband. Let’s just say I’m not the most graceful cook. So to keep it on the safe side I started checking out baked wing recipes. Then I came across these crispy baked wings by Kristen and I loved the sound of her flour trick! So I incorporated that into these wings along with a modified honey bbq sauce that I found. A mash up of two yummy recipes? Yes, please! And these Crispy Baked Honey BBQ Wings were born. 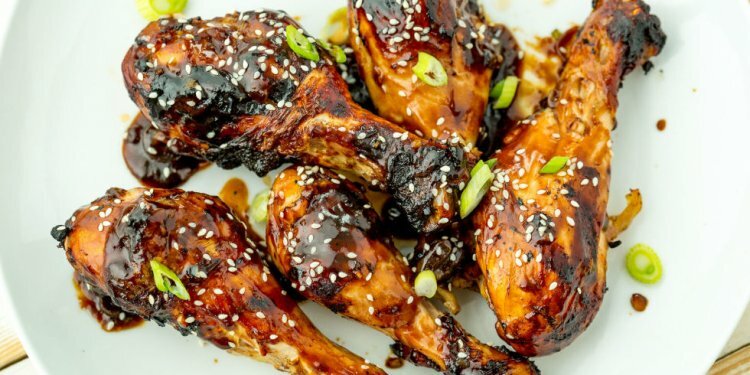 These Crispy Baked Honey BBQ Wings are easy to make and perfect for game day! In a small bowl, mix together flour, salt, garlic powder, chili powder and black pepper. Wash, dry, and dip the wings into the flour mixture until coated. Cover a cookie sheet with foil and spray with a generous spray of cooking spray.